Where am I? Which way back to the truck? How far to the lake? 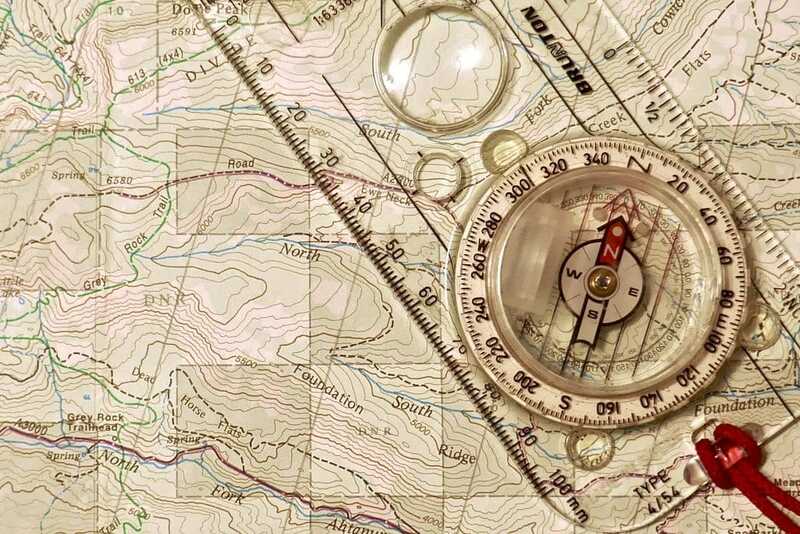 If you’ve ever asked yourself those questions as you were hiking the backcountry perhaps it’s time to review the basics of map and compass before you head out again. 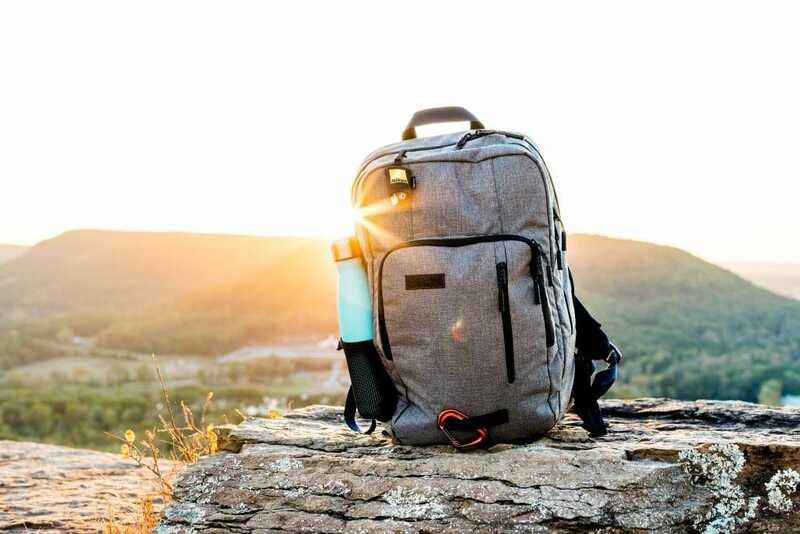 Today we have high-speed GPS units and InReach satellite communicators and our trusty smartphones, but you should still carry the old-school stuff. 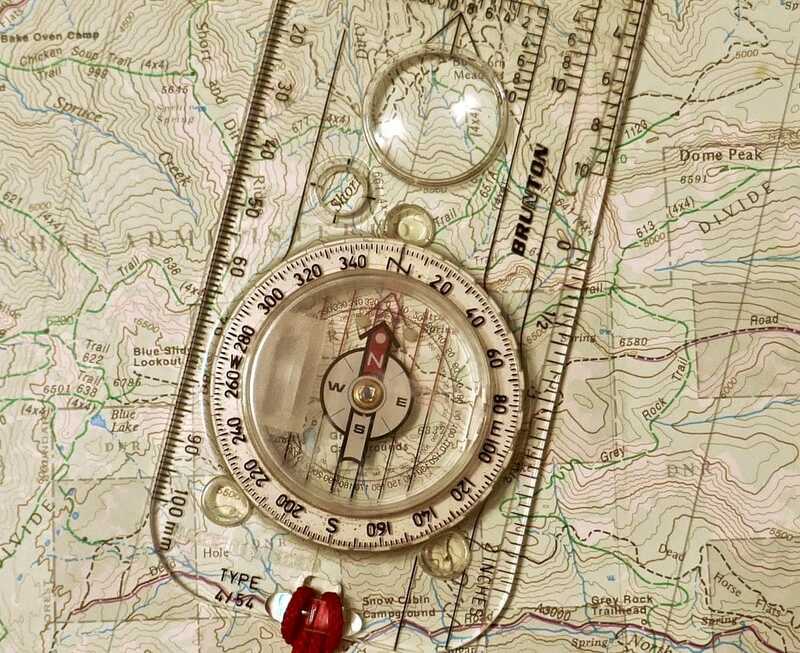 Why do we need to carry a map and compass? Cell coverage dies not too far into the wilderness. Heavy timber or even a bad snowstorm will prevent your GPS from getting a strong signal and telling you where you are. All of today’s cool tools have batteries that will inevitably die in cold weather or likely just when you need them most. Never in all my years of stumbling around in the mountains has my compass quit or my map refused to give up valuable information. They always work, if you know how to use them. 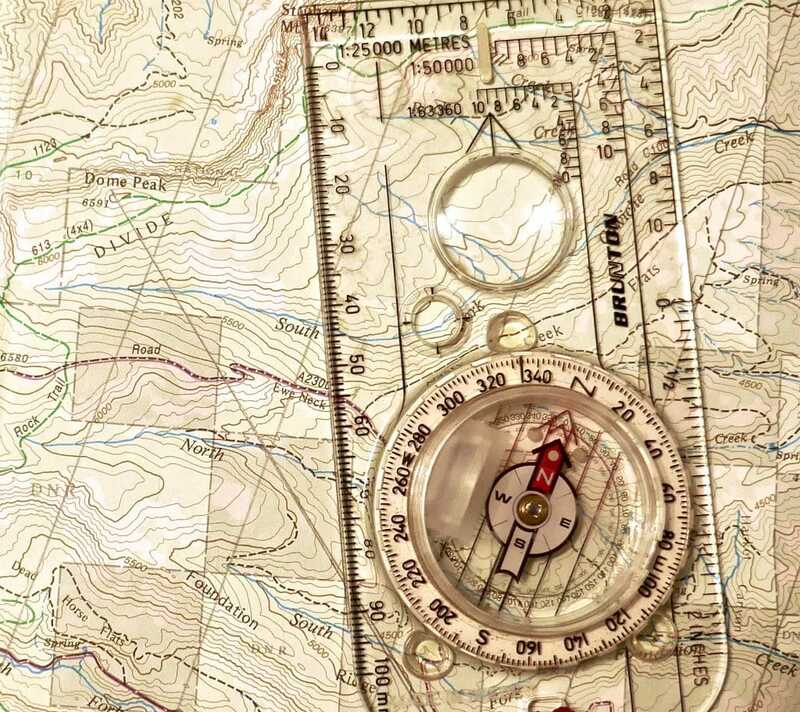 Map and compass basics are something every Boy Scout learns. If a 12-year-old can master basic navigation, so can you. Every map has a story to tell and a bunch of information to share with you. I would suggest the USGS 7.5 minute topographic maps for the most detail and to really see the terrain you are traveling. The 7.5 minute series of maps have a scale of 1:24,000 meaning that roughly 2 ½ inches are equal to one mile. The area the map covers is roughly six miles by nine miles. Generally, the top of the map will indicate the area the map covers or the quadrangle. At the bottom of the map, you will find a lot of useful information. You will find the scale of the map, the map datum, the legend, contour interval, and the declination information. Red means roads and survey information. Black means minor roads, trails, railroads, etc. Basically man-made features. 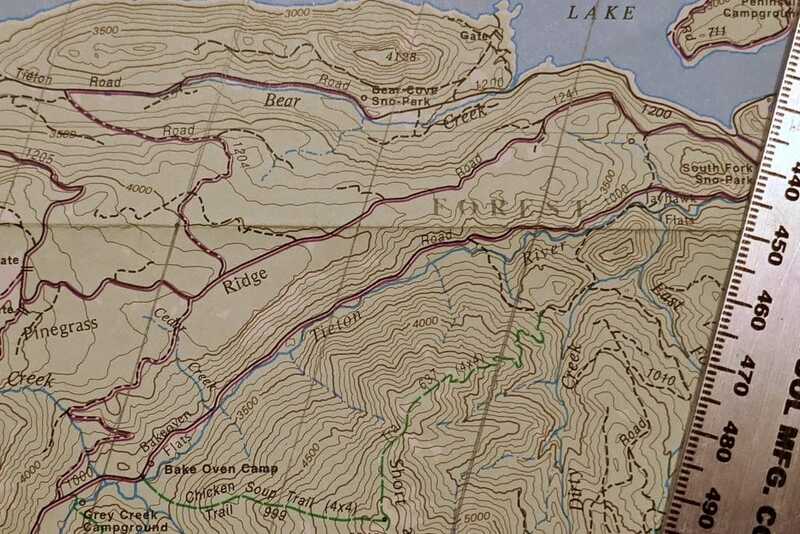 The value of the topographic map is that the contour lines give you a sense of the landscape. 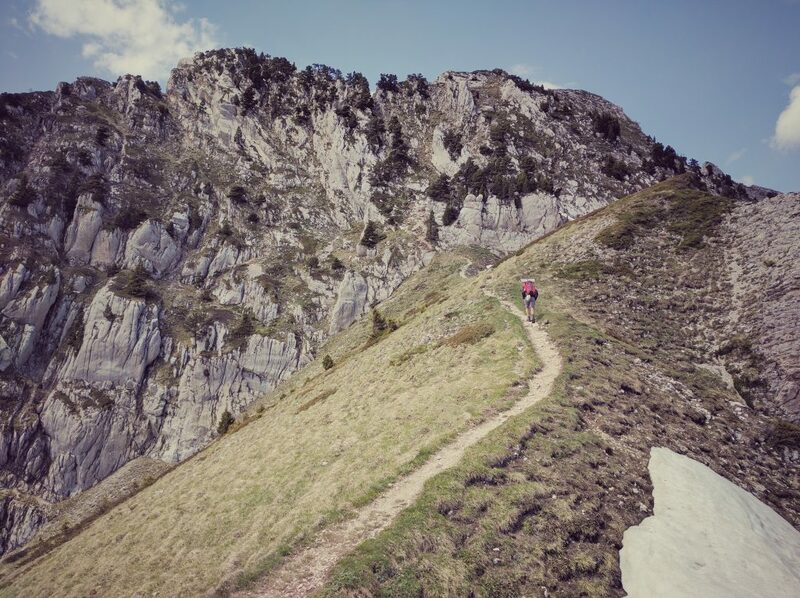 Once you learn what the contour lines are telling you, you can find the best routes to travel. 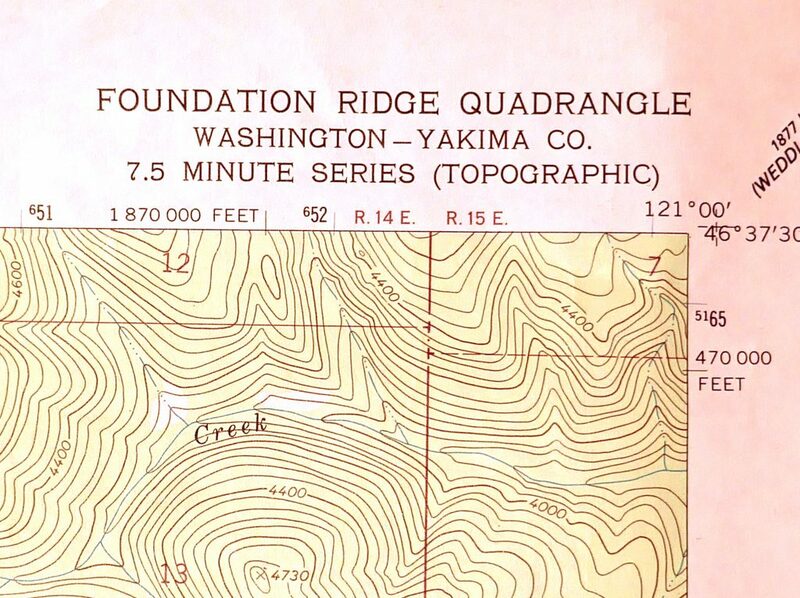 If your map has a contour interval of 40 feet, that means between each of those little brown squiggles is 40 vertical feet. The more spaced out the contour lines, the gentler the slope. As the lines begin to stack up, the terrain is growing steeper. As you look at the map and see an area where the contour line creates an enclosed circle or shape that is the top of a peak or hill. Where the lines are a ‘V’ or ‘U’ shape that means we have a ridge or valley. Look at the open end of the ‘V.’ If there is a blue line running on the center of the ‘V’ it means there is a stream or river, and it flows downstream in the direction of the open end. Finally, the edges of the map have some critical information needed for navigation. For our purposes, we will stick with UTM (Universal Transverse Mercator) for our route finding and navigation. The reason for this is because the UTM system is a standard grid made for a flat surface, while Lat-Lon is a grid made for a sphere overlaid on a flat surface. No matter what map we use and where in the world we are, all our measurements and position plotting use a standard grid if we stick to UTM. A UTM coordinate is expressed as your distance from west to east, your Easting, across your map in meters as well as your distance in meters north from the equator, your Northing. The numbers on the map margin always get bigger as you go east and always get bigger as you go north. Whenever we use a map and compass together and if we choose to use a GPS as an additional tool to navigate we are dealing with three norths. This is the geographic North Pole and the axis the earth turns on. This is the north your compass needle points to. It is the magnetic field that is created by the earth’s elements. This is simply the difference, in degrees, from True North to Magnetic North. A line that runs roughly down the Mississippi River is zero-degree declination, or very close to where the True North and Magnetic North align. If you are west of this imaginary line your compass needle is pulled more to the east. 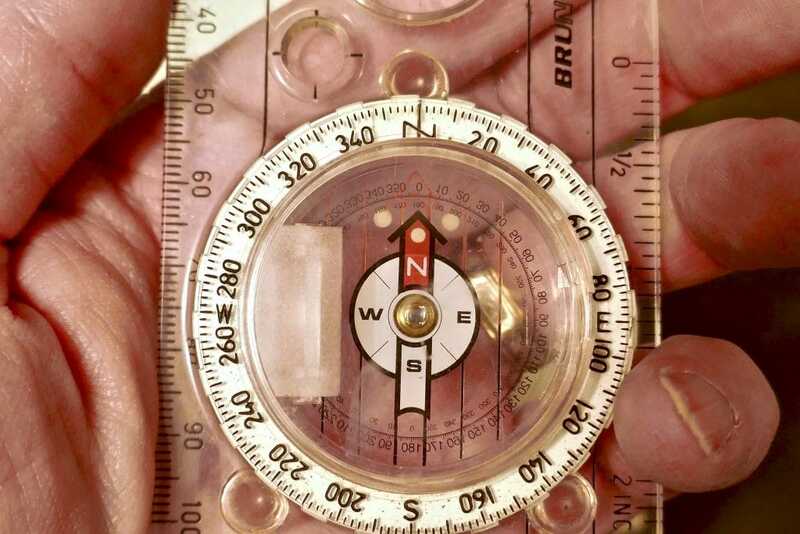 If you are east of the line your compass needle is pulled more to the west. Understand that your map and the declination stated at the bottom may be outdated since the figures change constantly. To find the current declination of the area you are traveling, this link at NOAA will zero in on any place in the United States. 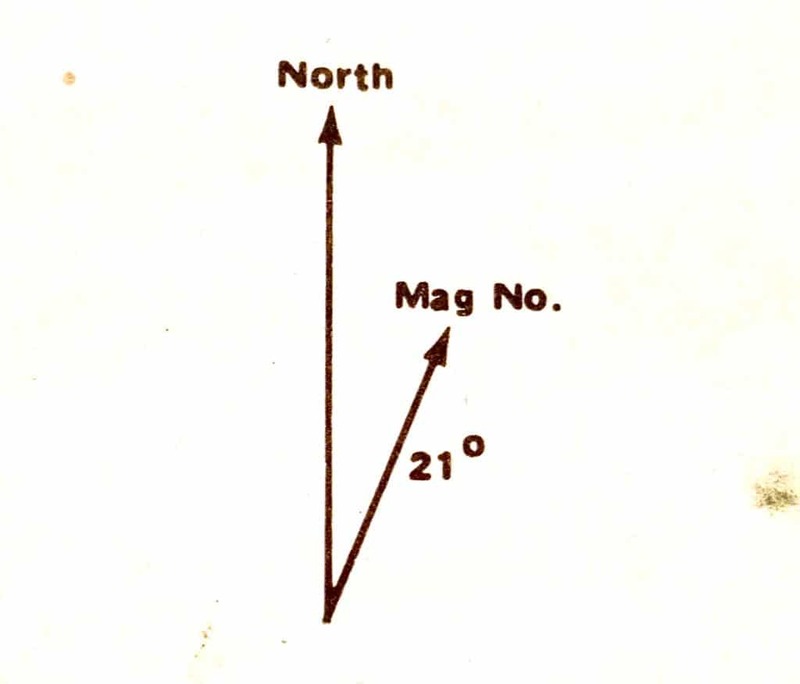 Once you have the current declination you can use your compass as a protractor to draw in lines at the correct angle to indicate Magnetic North. A compass is just a tool that tells you which way magnetic north is. It does not tell you where you are, what direction to go or how far you are from camp unless you know how to use it with your map. Below you will see the basic parts of a typical compass. On the dial, you will see the cardinal points: north, south, east, and west. You will also see that the dial is divided into 360 degrees. On this compass, each small mark is two degrees. The needle is the part that points to magnetic north. In most cases, this will be red. To utilize the compass hold it flat on your hand with the direction of travel arrow pointing away from you. Hold the compass at a height between your waist and chest and away from your body a bit to eliminate any magnetic interference from things like a belt buckle, pen, cell phone, etc. Now, turn your entire body until the needle lines up with the orienting arrow. The direction of travel arrow and you are now facing north. Now, turn your body until the needle is aligned with the east cardinal point or 90 degrees. 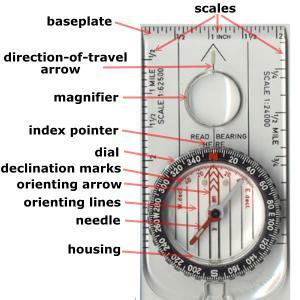 With your free hand turn the dial until the orienteering arrow is aligned with the needle. Read your bearing at the index pointer. It should be very close to 270 degrees or west. The direction of travel arrow and you are facing west. Now, let’s take a bearing. Suppose you are standing on a trail and can see a peak on the horizon. Hold your compass as we discussed above. Turn your body so the direction of travel arrow is pointing toward the distant peak. Now, holding the compass still, turn the dial until the orienting arrow lines up under the needle. Read the bearing at the index pointer. This is the bearing in degrees you would need to follow to travel to the peak. In order to use your compass with a map to plot your position, you must orient the map. This simply means the map must be laid out in line with your position on the earth. Remember we talked about declination above. In order to correctly orient your map, you need to determine the current declination for your area. Then, with a straightedge, you can draw in parallel lines at the correct angle relative to the true north lines on your map. For my location, the declination is 15 degrees. That means I need to draw a set of lines across my map that are 15 degrees east of the true north lines. The outside edge lines on your map are true north, so use those to draw in the magnetic north lines on your map. If you do this simple step once you are in the woods you do not have to make any adjustments for declination. Your compass is pointing magnetic north and your map will be oriented magnetic north so all the bearings and plotting you do will be correct. To orient the map, turn the compass dial to zero degrees. 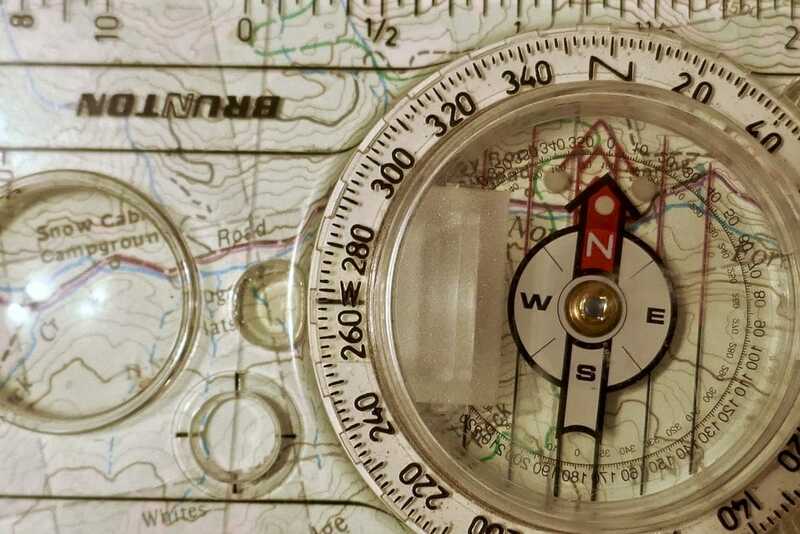 Place the edge of the compass parallel to one of the magnetic north lines you have just drawn on your map. Now, turn the map and compass together with the compass staying on the drawn-in line until the needle and the orienting arrow are in alignment. Your map is now oriented to magnetic north. Let’s say you can see the Dome Peak shown to the right of the compass in the map above in the distance. 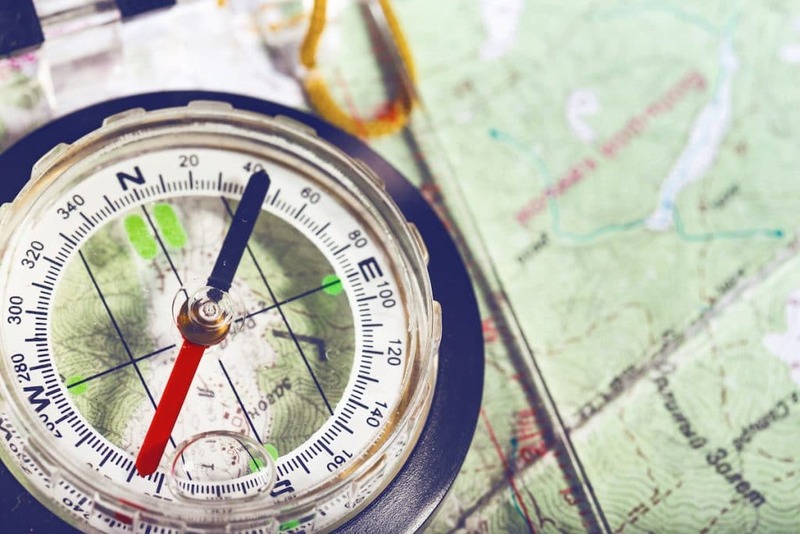 Hold your compass in front of you with the direction of travel arrow pointing to Dome Peak. Next, turn the dial until the orienting arrow lines up with the direction of travel arrow. Now, place one edge of the compass on dome peak on your map (which you have already oriented). 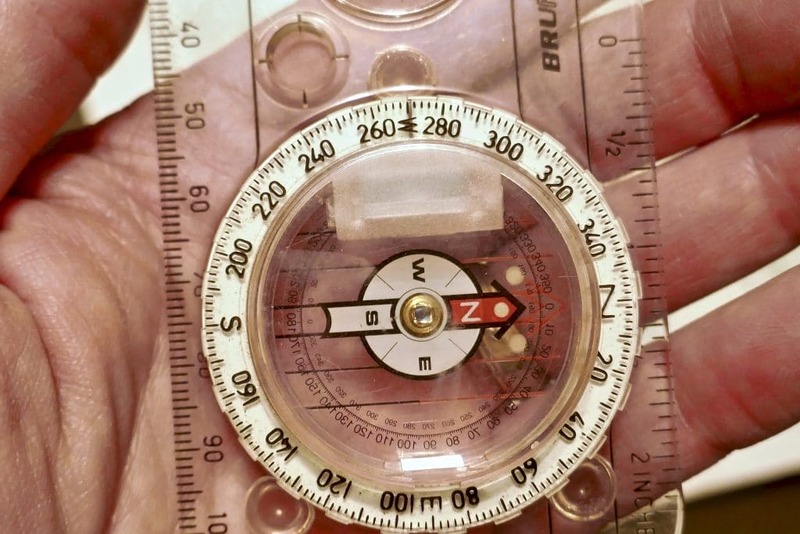 With the compass edge on Dome Peak slowly rotate the compass around the point until the Orienting Arrow and lines on the bottom of the dial are in parallel to the Magnetic North lines drawn on your map. Now, draw a line with a pencil from Dome Peak down the edge of your compass. You are someplace on that line. 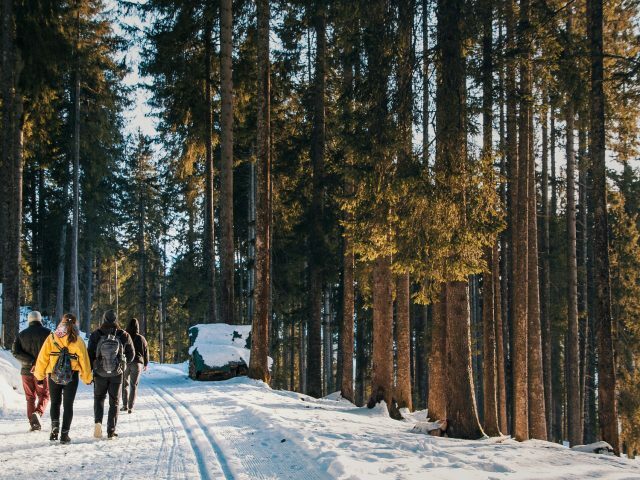 If you are on a trail or road, wherever the line you just drew crosses the trail is your exact location. 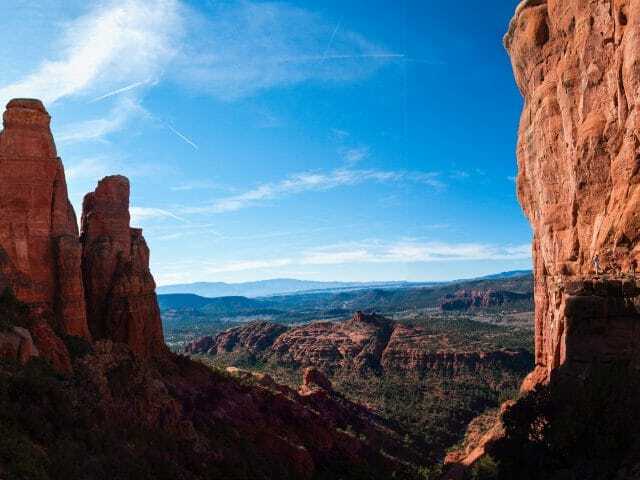 If you are not on a trail or road and can see a second peak or major landmark repeat the above process. Take a bearing, lay the compass on the map, rotate the compass around the landmark until the orienting lines are parallel. Then draw in a new line. Where this new line and the first line you drew intersect is your exact location. This process is called triangulation, and is an excellent way to be able to determine where you are on any map should you have to tools discussed above. 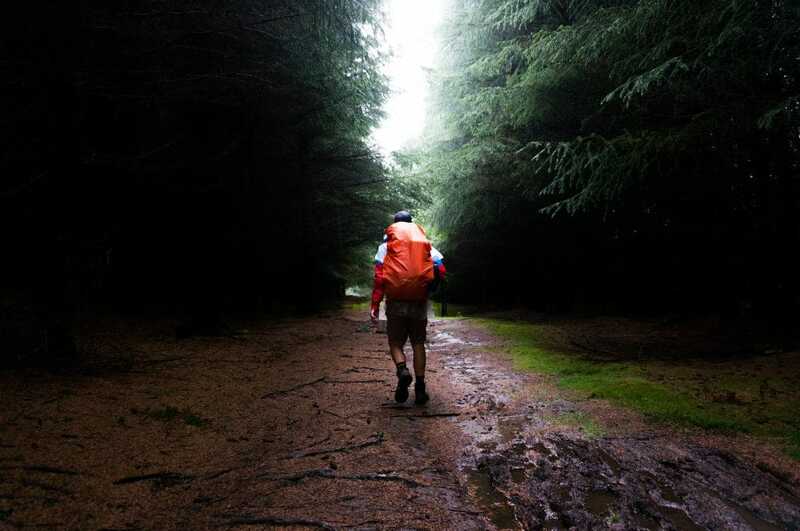 To plan a route cross country you can work out the direction of travel a couple of ways. Let’s say you are at Little Lake and want to cut cross country to Green Lake shown on the map above. First orient your map as described above. Then, lay your compass on the map with the edge on Green Lake and Little Lake. Holding the compass in place, turn the dial until the orienting arrow and lines are parallel to the magnetic north lines you drew on the map. Read the bearing at the index pointer. This is bearing you follow as you travel cross country to arrive at Green Lake. If you can see your objective, simply hold your compass and take a bearing on the objective. 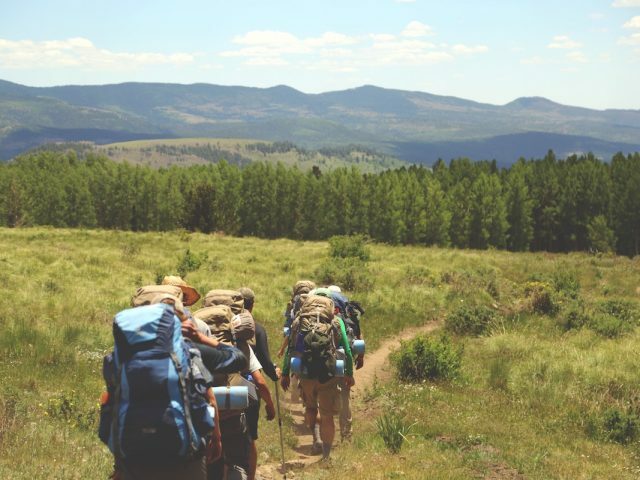 As you travel and lose sight of the objective, check your travel by occasionally stopping, holding the compass and turning your body until the needle and orienting arrow align. Find an object out in front of you that lines up with the direction of travel arrow and move to that point. Then check your travel again and continue in this way until you reach your destination. 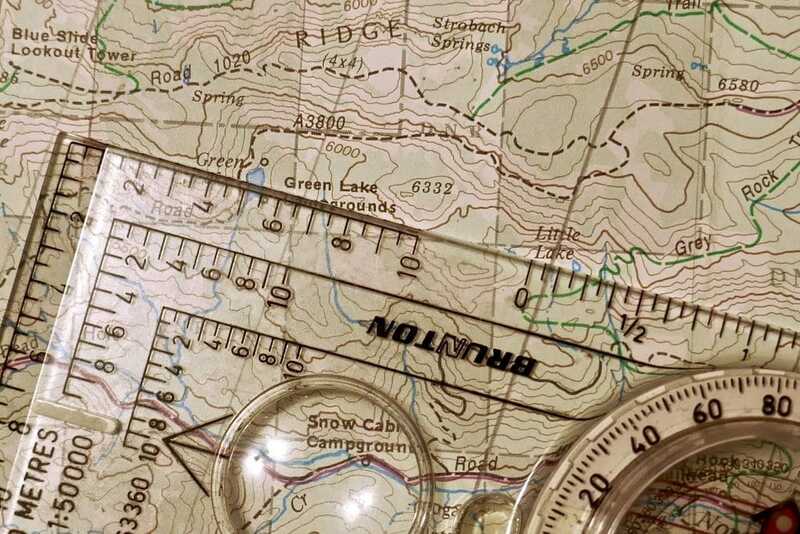 These are the most basic of instructions and what you need to begin using your map and compass together for backcountry navigation and travel. Practice taking bearings at the park or in semi-open areas that you are familiar with. 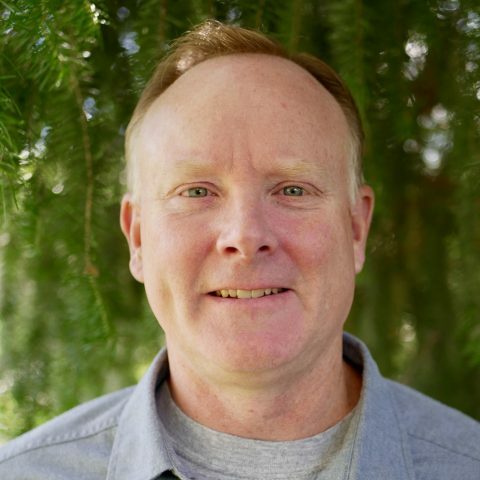 Once you are comfortable with that part of the process, practice orienting your map. If you can hike to a high point with a good view, orient your map and practice identifying other peaks or lakes or ridges you can see around you. 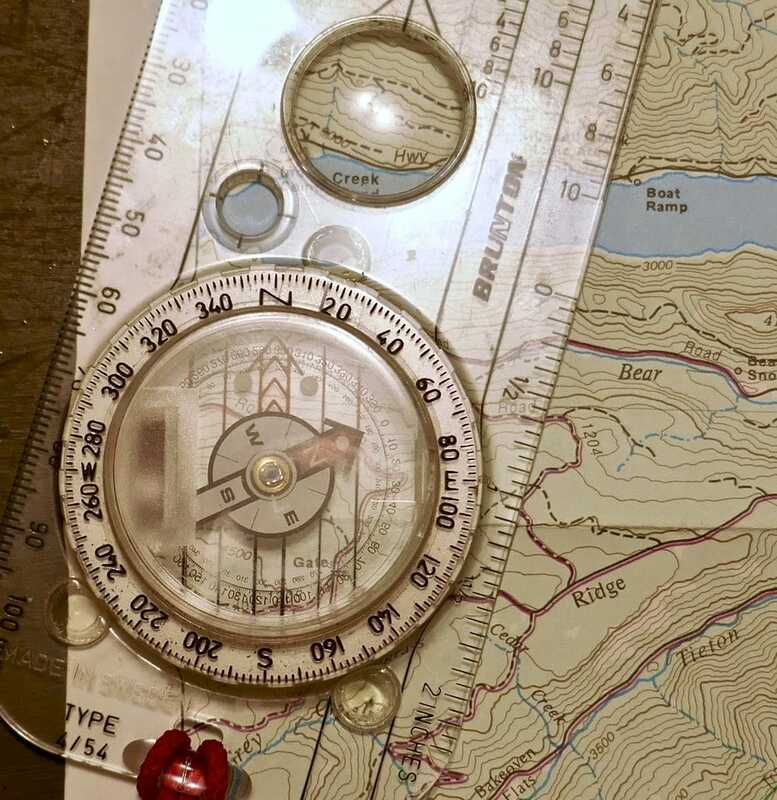 To confirm your landmarks, take a bearing on them, lay your compass on your oriented map and see if the line you draw crosses the peak or point you are sitting on. 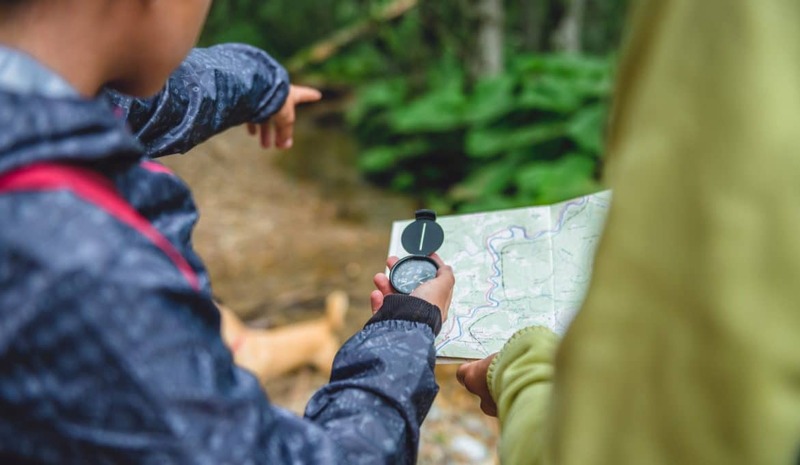 Once you are comfortable with this process, plan a hike using just your compass to plot a route and follow a bearing to a lake or peak or meadow to see if you can hit. Don’t go far. Just make sure you can’t see your objective and have to use your compass to get you there. Practice these exercises with a buddy if you need to. If you have a GPS, save the location of your truck or the trailhead to be sure you can get back if you make a mistake. As your confidence grows, extend the distances traveled. Pretty soon you’ll be fully capable of traveling without your battery reliant tools to anyplace your heart desires. Do you have any experience working with a map and compass? If so leave a comment below!